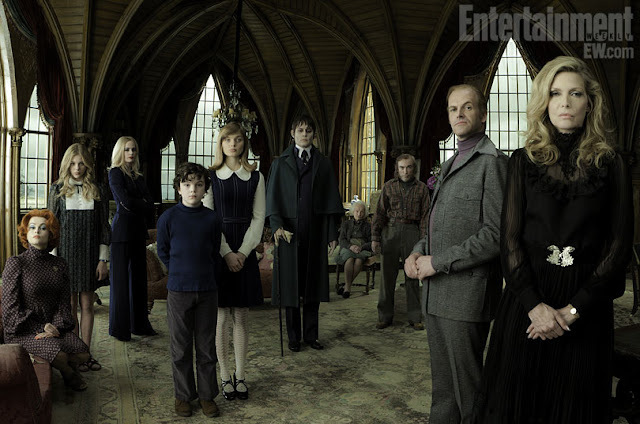 Entertainment Weekly has published the first official cast photograph from the new Dark Shadows feature film, which is seen above. From left to right: Helena Bonham Carter (Dr. Julia Hoffman), Chloe Moretz (Carolyn Stoddard), Eva Green (Angelique Bouchard), Gulliver McGrath (David Collins), Bella Heathcote (Victoria Winters), Johnny Depp (Barnabas Collins), Ray Shirley (Mrs Johnson), Jackie Earle Haley (Willie Loomis), Jonny Lee Miller (Roger Collins) and Michelle Pfeiffer (Elizabeth Collins Stoddard). More info here on the Dark Shadows News blog.